The Riigikogu approved with 89 votes in favour (1 abstention) the Act on Amendments to the Product Conformity Act (247 SE), initiated by the Economic Affairs Committee. The Act provides for the regulation regarding the fees charged for accreditation and the assessment of the professional competency of measurers. The fees charged for the service are used to finance the existence and functioning of the provider of the service. The amendments contain the regulation concerning the structure of the fees for the services of the accreditation body, and important standard conditions relating to certain fees. The Act eliminates a legal deficiency, because the fees charged for mandatory accreditation had been provided for by the person in private law providing the service, and not by an Act. As is known, it is a public law service and fee, i.e., the establishment of this fee must be provided for by an Act, or a provision delegating authority must be in place. In the accreditation fee rates and also the fee structure, the price list of 2014 of the Foundation Estonian Accreditation Centre has been taken into account. Annual fees may change in the future depending on the number of customers, and changes to the general expenses of the Foundation Estonian Accreditation Centre. The Act enters into force pursuant to general procedure. The Riigikogu approved with 86 votes in favour (3 abstentions) the Act on Amendments to the Environmental Charges Act (233 SE), initiated by the Government, which specifies the principles of imposing the natural resource charges and highlights more clearly the charge based on the value of the natural resources belonging to the state. The Act differentiates the bases for establishing environmental charges for mineral resources used for energy production, such as oil shale and peat, form the bases for establishing environmental charges for other mineral resources that are used in construction. According to the Act, oil shale and peat are charged for on the basis of the market value of the energy products or replacement products made from them. This will allow the Government to establish a system for charging state revenue for energy mineral resources that will be dependent on the market value of the energy product. The price of energy products has been very changeable in recent years. The world market price of oil was very high from 2012 to 2014 which also brought about high state revenue from the oil shale sector. As the charging of state revenue had been provided for in advance for every year, the state did not charge all the possible revenue for its resources in these years. In the last couple of years, however, the price level of energy carriers has dropped very low. It has therefore become important for the state that the system of charging state revenue for these mineral resources would allow for taking sufficient account of the market situation. For this reason it has been analysed how to interconnect the system of collecting the resource charge and the market price. In addition, the minimum rate of environmental charges for oil shale and peat is reduced in the Act as of July 2015 to the level that would serve as compensation for the disturbance accompanying extraction in the local region. It will be accrued by local governments. The remaining share will be received in the state budget. The level for that is established in view of receiving the state revenue to the extent of which it will be possible for the Government to implement the system dependent on the market price. Besides that, the Act retroactively repeals the use of increased coefficients of ambient air pollution charges in selected regions as of 1 January 2016. The Riigikogu approved with 89 votes in favour (1 abstention) the Act on Amendments to the Water Act (243 SE), initiated by the Government, which specifies the providing of information relating to bodies of groundwater in water management plans and regulates the grazing of animals on shores of inland water bodies. The Chairman of the Rural Affairs Committee Ivari Padar, who took the floor during the debate, said that the amendments introduced to the Water Act would clear up the issue of the grazing of animals on pastures on the shores of inland water bodies that had been unsolved for a long time. The amendment of the Water Act resolved a shortcoming of the Act that was passed last year where grazing is permitted on coastal pastures but the issue remained unsolved in regard to other bodies of water. After additional assessment of the impact of grazing in water protection zones, requirements were introduced into the Act that stock farmers must observe when grazing in water protection zones. Meelis Mälberg, who participated in the proceedings on the Bill on behalf of the Environment Committee, noted that the amendments had been introduced into the Act in cooperation with the Ministry of the Environment, taking into account the positions of both stock farmers and the Ministry of Rural Affairs and the Rural Affairs Committee. The Act transposes the amendments to the EU Groundwater Directive which specify the providing of information relating to bodies of groundwater in water management plans. According to the Act, information concerning every exceedance of pollutant content has to be pointed out in the water management plan. Thanks to specified data, it will be possible to compare the condition of bodies of groundwater in Member States, to harmonise the methodologies for the evaluation of the pollutant content, and to plan more specific activities to protect groundwater. The state reviews the water management plans every six years. The Riigikogu approved with 68 votes in favour (2 abstentions) the Organisation of Energy Sector Act (162 SE), which provides guidelines for achieving energy efficiency in energy production, consumption and distribution. The Act transposes the European Union Energy Efficiency Directive that provides for obligations for the public sector and the private sector. The Organisation of Energy Sector Act consists of thematic blocks. Pursuant to the Act, the public sector, first of all the central government, must fulfil an exemplary role as regards energy efficiency. The central governmental authorities are obliged to reconstruct three percent of their buildings each year to meet at least the minimum energy performance requirements, that is, class D. Also, in the future, when conducting public procurements, the central governmental authorities will be required only to procure buildings, products and services having the highest energy efficiency class, insofar as this is economically justified. One of the thematic blocks of the Act is the obligation of the state to achieve annual energy saving of 1.5 per cent of the energy sold to final customers nationally until 2020. This will mean 7.1 terawatt-hours of energy saved for Estonia during that period. Various policy measures financed from the state budget will be implemented for that. For the planning of policy measures, the obligation to provide consumption information is imposed on larger energy utilities, who will have to measure the energy use by final consumers and to provide access to the consumption data of final consumers free of charge both in real time and ex post. The Act also provides for the installation of individual and heat cost allocators or meters of final consumers where their use is economically reasonable. Pursuant to a requirement of the directive, the Act provides for an obligation to carry out energy audits in large enterprises every four years in order to create preconditions for achieving extensive energy saving in the industry sector on a wider scale. The Act implements only the measures absolutely required by the directive. The deadline for the transposition of the directive was 5 June 2014, and the European Commission has initiated infringement proceedings against Estonia because of the delay. In the opinion of Chairman of the Economic Affairs Committee Toomas Kivimägi, it is a compromise reached in the 24th hour, and therefore the final solution is not ideal. “With the passing of this Act, we managed the risks of possible court proceedings against Estonia for not transposing this directive, which in the case of the worst scenario would have meant a fine of 3.6 million euro a year. I acknowledge all parties for the consensus decision we reached, and for efficiency,” Kivimägi said. The Act will enter into force pursuant to general procedure, that is, on the tenth day following the date of publication in the Riigi Teataja. Some provisions will enter into force on 1 October and on 1 January next year, like the requirements for energy efficient purchases in the public sector. The Riigikogu approved with 66 votes in favour (8 abstentions) the Resolution of the Riigikogu “Appointment of a Member of the Estonian Public Broadcasting Council from among Members of the Riigikogu” (263 OE), submitted by the Cultural Affairs Committee. With the Resolution, member of the Riigikogu Andres Anvelt is appointed as a new member of the Estonian Public Broadcasting Council, because the current member of the Council Mihkel Raud declared his resignation from the office of member of the Council on his own accord. The Social Democratic Party Faction made the proposal to appoint Andres Anvelt as a new member of the Public Broadcasting Council. The Bill on Amendments to the Riigikogu Rules of Procedure and Internal Rules Act (221 SE), initiated by the Estonian Free Party Faction, provided for ensuring the preservation of documents, draft documents and recordings that are significant to the history of the Riigikogu. In the opinion of the representative of the initiator of the Bill Andres Herkel, it should be ensured that recordings are preserved once they have been made. Herkel said that materials and analyses on paper that have been used in committees should also be preserved. The Chairman of the Constitutional Committee Kalle Laanet said that the Constitutional Committee had proposed to reject the Bill at the first reading. Six members of the committee had voted in favour of the proposal, three had voted against, and there had been one abstention. 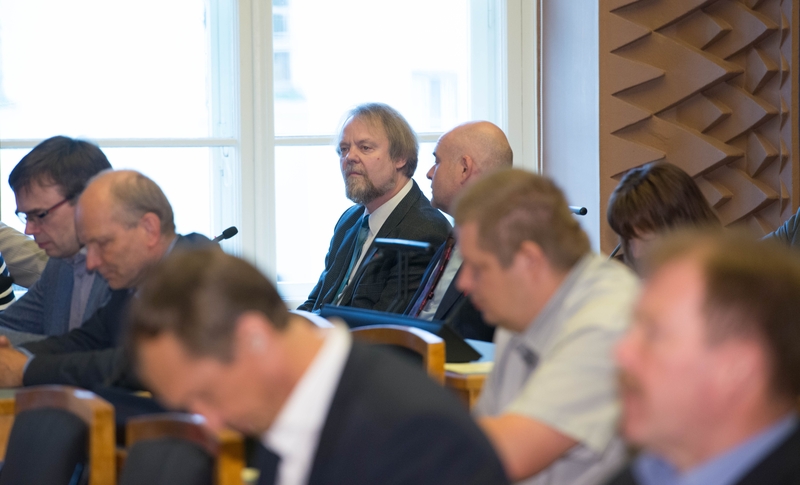 Jüri Adams, who took the floor on behalf of the Free Party Faction in the debate, found that a specialist or a working group would be needed to resolve the deficiencies in the rules of procedure of the Riigikogu. “If for the moment we postpone the addressing of the deficiencies in the rules of procedure to a more distant future, it will not make things better for us or the following Riigikogus,” Adams said. The result of voting: 49 votes in favour, 21 against, 1 abstention. Thus the Bill was rejected and it was dropped from the proceedings. In connection with resignation of Mihkel Raud, Toomas Jürgenstein took the oath of office of a Member of the Riigikogu at the beginning of the sitting.